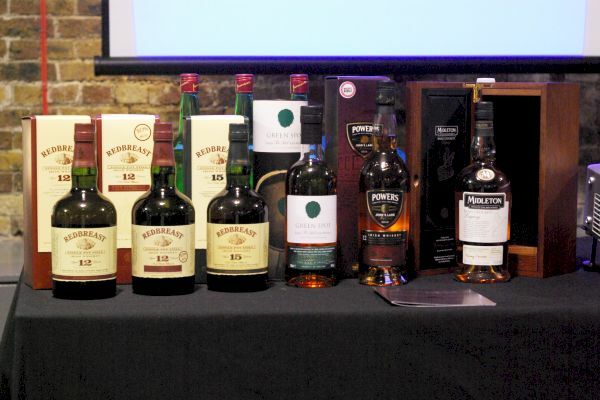 We may have been a couple of days late for a proper St Patrick’s day celebration, but we gathered a bunch of Irish whiskey fans at Vinopolis on Monday to have a go anyway. The plan was simple – taste our way through the recently revamped Single Pot Still range of whiskies from Irish Distillers. The added bonus was that to lead the tasting we’d managed to import their master distiller, Barry Crockett, fresh from a weekend of celebration and Responsible Drinking at the Midleton distillery. Tim and I were joined at the tasting by former Prince of Pre-emptive Stock Allocation (aka Preorders), now elevated to King of New Products on the web team (Michael) whose notes will be joining ours below. Midleton make three different styles of pot still spirit, varying the ‘cuts’ when distilling to create light, medium and heavy spirits. 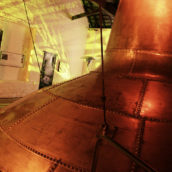 Along with that they fill into a variety of casks, mainly bourbon and a smaller amount of sherry, with some rum, marsala and port wood as well, giving quite a range of flavours to combine to make their whisky. First dram of the night was the venerable Redbreast 12 year old, a long standing favourite here at TWE Towers and, on a more personal note, the first Irish Whiskey that I remember trying other than Jameson. I described it as ‘peaty’ and didn’t like it. It is not peaty. I was young and foolish. It was a long time ago. It’s a mixture of two styles of pot still spirit, light and medium, and is matured in a mix of both bourbon and sherry wood. What did we reckon? Nose: Rich spiced fruit, hints of orgeat sweetness, toast with generic Red Jam, creamy porridge with brown sugar, Cinnamon Grahams. Palate: Softer and creamier than the nose suggested: spiced spongecake packed with dried fruit and smothered with soft, buttery icing. Finish: More cream and fruit, fading into dark and spicy wood. Comment: This is the ‘entry level’ whisky in the Single Pot Still range? Putting my youthful ‘peaty’ foolishness aside, this an excellent dram. Nose: Lovely fruit aromas of raisins, mixed peel and apple, plus lifted honey, vanilla and ginger. Voluptuous, and not shy about it. Palate: Redbreast’s unmatchably silky delivery remains, and as ever it cloaks the harder grainy side of this meticulously-balanced masterpiece. Rich and raisin porridge-esque, with spongecake and polished oak. Finish: Good length with extraordinarily tight-knit integration as always. All the flavour elements are so well-woven it’s almost impossible to separate them. Comment: Redbreast 12yo never seems to put a foot wrong – there’s just so much to admire here. If there’s a more accessible whisk(e)y of this quality anywhere in the market I’ve yet to find it. 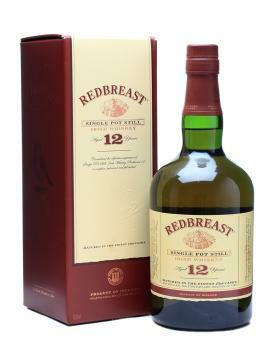 We then moved on to recent rising star, Redbreast 12yo Cask Strength. Launched at Whisky Live Paris at the end of last year we’ve been waiting patiently for it to arrive ever since. Having Barry along to host the evening seems to have applied boots to the correct sensitive places and it has finally appeared on our shelves, although how long it’ll last for is another matter. Palate: Much nuttier and more treacly. Strong pepper and chocolate notes, apple peel, raisns and rich dates. Big and mouthfilling, with porridge and assertive – but not overpowering – oak. Finish: Quite dry and spicy, but retaining its generous richness. Comment: Superb, multi-nuanced and uncompromising. A must-try. Nose: Strong sherry notes with dates and dried fruit. Palate: Creamy with slight spice and more fruit. Wood comes in towards the end. Finish: Long and slightly smoky, coming back to more sweet spice. Comment: A deceptive whisky, easing you in with floral fruity notes before blind-siding you with wood and spice. Nose: Big spice off the bat, with crunchy green apple, an edge of balsamic vinegar, sweet lemon and cream – zesty pannacotta with cinnamon sticks and a sour glaze? Palate: Orange cream, creamy porridge, woody spice and a sticky-liqueur edge, although not too sweet. Finish: Woody spice – clove, anis – and dried orange peel. Quite Christmassy. Comment: Not as juicy as I was expecting from the younger version, but still rich and elegant, although maybe a bit too restrained for my liking. Nose: Very rich, with chocolate and some very pleasant honeysuckle floral notes. Returning later on, I found some tropical fruit: apricot, peach, melon. 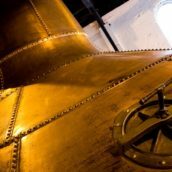 Palate: All the notes from the nose, plus chewy potstill spices and some faint hints of legumes – Barry had mentioned them for the Cask Strength, but I found them here instead. Rich and sweet, with the rich tinned exotic fruit from the nose, plus clove and cinnamon spice. Finish: Long, spicy and very, very good. 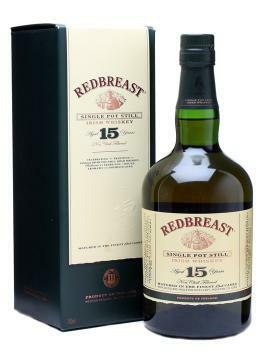 Comment: I wasn’t in love with this on the last two occasions I tried it before last year’s rebranding (due to a suggestion of sulphur), but this is hands-down the best Redbreast 15 I’ve had since the legendary first bottling. Moving on from the Redbreasts, we arrived at Green Spot. 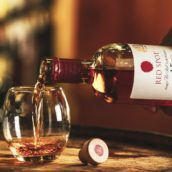 Originally produced for Mitchell & Sons, a Dublin wine merchant, it now gets a bit further afield and is sold by a few specialist retailers outside of Ireland. 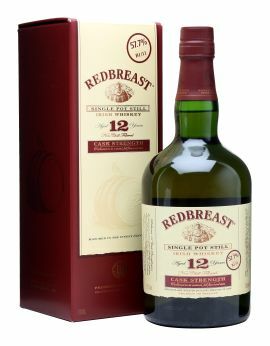 It’s a step on from the Redbreast in flavour terms as well, being entirely made up of medium pot still style spirit, although with a smaller proportion of sherry and a predominance of refill rather than first fill bourbon casks. Nose: Raisins, sugar snap pea pods, some perfumey apple and honeyed exotic fruit. Very clean barley. Becomes leafy with time. Palate: Seems light after the Redbreasts, but fresh and clean with Danish pastries and fresh green apples, hot-buttered toast with honey and, as on the nose, the barley/cereal note is exceptionally well-defined. Finish: Lightly drying, with honey & spice. Comment: Another very approachable, moreish single pot still. Nose: Big green apple notes, candle wax, olive oil and some raisiny sweetness with a bit of cereal hiding underneath. Palate: Soft and creamy apple – baby food apple puree? Fresh and piney edges with green rhubarb and tropical fruit squash. Finish: You get a massive hit of both real and fake apple as soon as you swallow the whiskey, reminding me of apple flavoured Hi-Chew sweets. Comment: A very different whiskey to the Redbreasts – very fresh and green, but with a heavy oiliness as well. My favourite of the night. 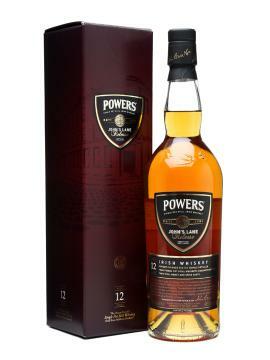 Next was the first of the two new entries in the Single Pot Still range – Powers John’s Lane, named for the old Powers distillery in Dublin, closed in 1975 in favour of the current plant at Midleton. 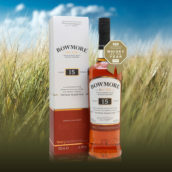 It’s a B1 (Midleton nomenclature for first-fill bourbon casks) led pot still whiskey with a hint of sherry to round it out. Jim Murray liked it enough to declare it Irish Whiskey of the Year in this year’s Whisky Bible, but what did Tim and Michael think? Nose: Light but dirty, with an earthy feel. Palate: Oily and sticky, with gentle spice and chocolate/cocoa. Finish: Medium length with soft light wood and some sweetness. 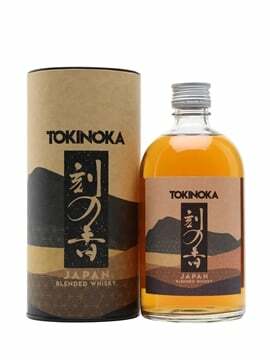 Comment: It made less of an impact than I expected, I think the previous four whiskies had started to dull my palate. Nose: Apple pie, this time accompanied by the peaches I noticed on the Redbreast 15, plus flapjacks and indeterminate floral, fruity notes. Palate: The pot still spices are very much more in evidence here, with the porridge & fruit rather subdued, to my surprise. Finish: Pastry notes & lingering warming spices. Comment: Regular readers will already be aware that I love this whiskey – indeed, I have a bottle at home that always seems to taste rather more special than this. Perhaps the running order has affected how it’s showing tonight (personally I’d have started with the Green Spot & John’s Lane before hitting the Redbreasts). 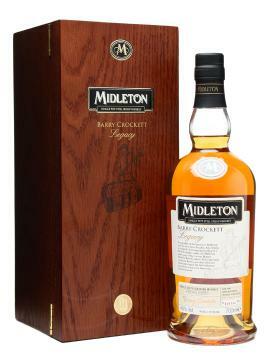 The last of the currently released whiskies on the mat was the one named for our host – Midleton Barry Crockett Legacy. This one is completely without sherry influence, matured in a mixture of bourbon casks and also with some influence from what IDL refer to as ‘B-Zero’ wood – brand new American oak casks, made by coopers in the US and shipped over to Ireland. The whiskies in Legacy are between 12-22 years old. Finish: Long with lightly charred wood. Nose: Fragrant aromatic oak, plus lots of honeyed tropical fruit and a delicate sandalwood character. Palate: Silky-smooth with fabulous tingling spices. Follows the nose, with dried apricot, vanilla & honey, plus some lovely flapjacky flavours. Finish: Soft, sweet and spicy. 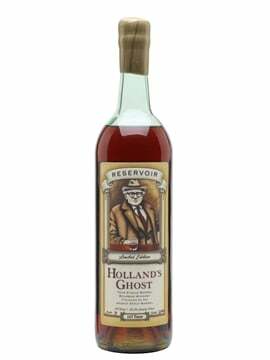 Comment: My comment is the same as the last time I tried this: Crystal clear definition: this is potstill HD, yet the complexity is such that it retains an air of mystery. 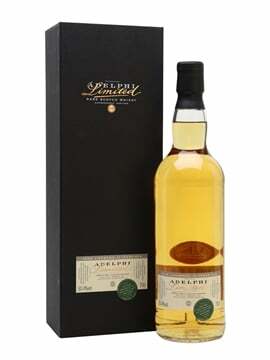 One of those rare, top-quality drams that changes emphasis with each approach, leading to frequent re-pours. A whiskey with a twinkle in its eye; not fully knowable, but captivating nonetheless. 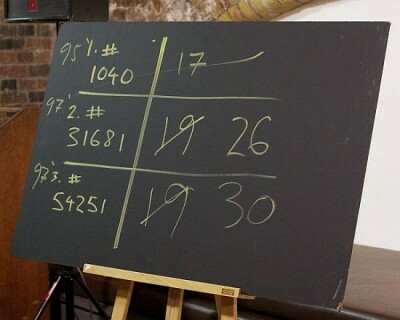 Next was the important bit of the evening: Barry had brought with him three cask strength cask samples, straight from the wood, each matured in B1 casks and chosen to each represent one of the three pot still styles. Everyone was to taste them and then deliberate, cogitate and digest before voting for their favourite. 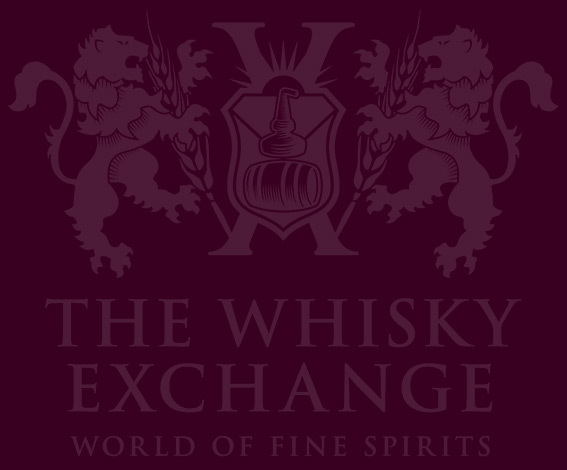 The winner would then be bottled as a Whisky Exchange exclusive. Easy. Or so we thought. 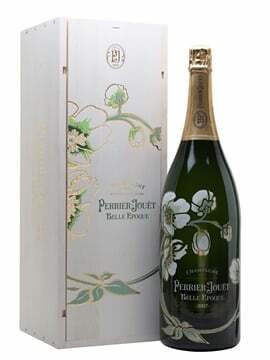 Nose: Very sweet and aromatic, with oily notes; then coconut biscuits, liquorice & ginger snaps; becomes very herbaceous. Palate: Big berry flavours (blackberry, cassis); some solvent on the backdraft, then peachy summer fruit – really lovely. Finish: Good length, peaches & sweet spice. Comment: This was my favourite. Nose: Classic Irish – creamy grain, soft peach and light spice. It’s sharpened up a little with some sour wood and a hint of rhubarb. Palate: Sour cream, cinnamon, lemon, rich dried fruit and sweet, juicy mango. 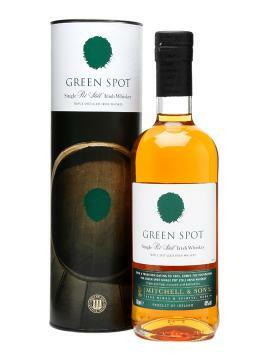 Comment: A toned down version of the Green Spot – more of the traditional Irish character but with some sweet and sour fruit to balance out the soft creaminess. Nose: Apple skin, sour spice, orange peel and cracked pepper, along with some sweet cream and light floral touches. Palate: Rich caramel with some umami behind it. Spicy wood and some grape skin tannins. Finish: Anis and menthol to start, quickly taken over by sweet wood and soft caramel. Comment: An interesting balancing act of astringent woody flavours and lighter fruit and floral notes. The voting began and sample #1 fell by the wayside by a couple of votes, much to the dismay of almost the entire TWE staff, leaving #2 and #3 on 19 votes each. 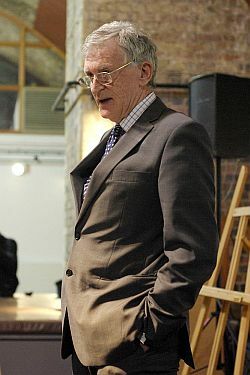 We’ve got some tweets from the evening up on Storify and a few photos up on flickr (we hope to have a few more soon). If you want to know more about the world of Single Pot Still whiskey, head over to our main website where Tim has penned an introduction to the range. He was also over at Midleton last year and you can read about his adventures on the blog, here and here. Many thanks to Barry Crockett and his IDL colleagues for a truly tremendous tasting.